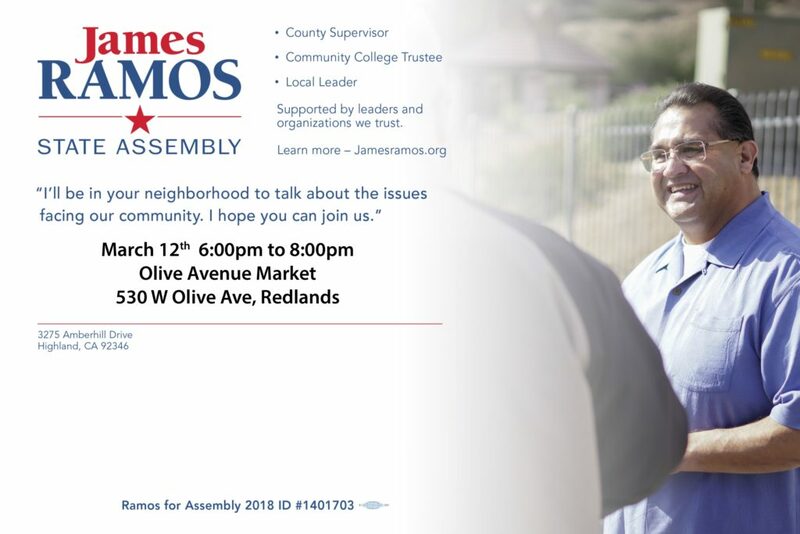 San Bernardino – San Bernardino County Supervisor James Ramos has started his campaign with a bang by picking up key local endorsements and showing a first campaign report that reinforces the strength of his Assembly campaign. The GOP candidate, Henry Nickel, who was recruited after Marc Steinorth dropped out to run for County Supervisor, raised less than $25,000 with the vast majority of his money coming from Republican Assembly members. “We are not taking anything for granted and have already held a number of community meet and greets throughout the district,” Ramos continued. Ramos, a Democrat, has served as a Supervisor of San Bernardino County since 2012. In 2015, he was unanimously elected by his colleagues to serve as Board Chairman. 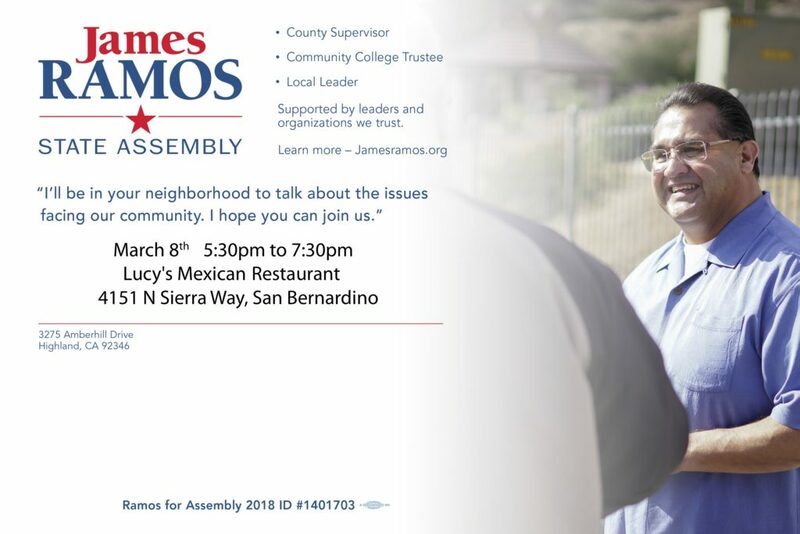 Ramos was the first Native American to be elected to the Board of Supervisors, and to the San Bernardino Community College Board of Trustees, on which he served from 2005-12. Since 2015 the district has seen a surge in Democratic registration, with Democrats now outnumbering Republicans by over 15,000 voters. In 2016 Hillary Clinton won this seat over Trump by more than 22,000 votes. Marc Steinorth, Highland’s representative in the California Assembly, won’t seek re-election. His name now appears on county registrar’s unofficial list of candidates as a challenger to two-term San Bernardino County Supervisor Janice Rutherford in District 2. Steinorth has yet to respond to phone calls and e-mails from the Highland Community News. The California Political Review quotes Steinorth as saying, “After two terms in the State Assembly I have done more than I ever imagined,” then questions what accomplishments he could claim after four years in the minority party. And it says Steinorth should return the $65,750 the California Republican Party gave him on Jan. 4 for his Assembly re-election campaign. The Assembly currently has 25 Republicans, 52 Democrats and three vacancies, giving the GOP less than a third of the votes. County Supervisor James Ramos, former chairman of the San Manuel Band of Mission Indians, recently announced his candidacy for Steinorth’s 40th Assembly District’s seat. Ramos shared Steinorth’s announcement in a press release on Monday. The website marcsteinorth.com doesn’t mention his decision, but still invites contributions to his campaign. Green Party member Carol A. Bouldin has announced her candidacy for the 40th Assembly seat, according to the registrar’s list. It also lists a candidate named Kenneth Petschow as a candidate for District 2 on the county board. Highland is represented by Ramos in District 3. If elected, a vote to replace him is likely in November. Redlands Mayor Paul Foster, Teamsters Local 1932, San Bernardino County Professional Firefighters, IAFF Local 935, and Robert Garcia, president of the Etiwanda School District board of trustees. In a press release on Monday, Rutherford announced the endorsement of state Sen. Mike Morell, a Republican who represents Highland in the 22nd District. Rutherford was an aide to former state legislator Bill Leonard. Before being elected to the Board of Supervisors in 2010, she served on the Fontana City Council for 10 years.